The bridge money lending market in the Midwest continues to grow every year. The growth in real estate investing popularity (e.g. HGTV, DIY network, A&E's Flip This House) has driven a substantial increase in local investors demanding bridge money financing. Following the real estate crash in 2007/2008, traditional banks tightened lending requirements, making it more difficult for investors and home buyers with strong credit ratings to obtain financing. This new environment has driven demand for Medford's product. The low interest rate environment set by the federal government has driven a surge in home buyers and thus increased demand for new homes – this in turn has led to an increase in real estate investors that demand Medford's product. 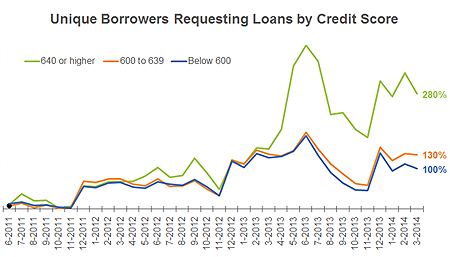 As seen in the chart to the right, loan demand has continued to grow in recent years. Based on the narrative above, there is substantial opportunity to make high-interest, asset-backed loans to a growing investor population. Investors are demanding loans, and we are serving that demand. These fundamentals have allowed us to consistently deliver above-market returns to the Company's investors. Speed – traditional lending takes 45-60 days to close, while Medford can close in 14 days. Eligibility – regulatory requirements imposed on traditional banks continue to expand, and largely focus on borrower creditworthiness. Bridge money lenders focus first on the property value and quality of the investment, and then secondly on the borrower's credit quality. Relationship – bridge money lenders often become 'partners' with their borrowers, as the process is very consultative; this creates a much deeper understanding of investments which reduces the risks associated with unknowns, while developing strong customer relationships which frequently generates return business. This is not generally the case with traditional banks. Project Support Services that protect both the borrower and investors, through involvement of a Construction Manager who regularly visits sites, performs inspections and provides consultative services to borrowers, and in-house underwriting and loan servicing.